Since 1996 I have been presenting at international conferences and (in-house) events. I've done many (opening) keynotes, talks and workshops, and participated in panel discussions. As you might have guessed, I enjoy being on stage. Here is a list of these conferences, albeit highly incomplete. For an overview of my training courses, see overview of my courses. 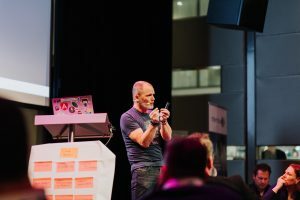 Overview of my upcoming and past keynotes, talks, workshops and panel discussions at conferences and events.